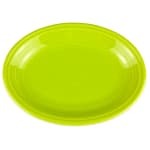 This Homer Laughlin 457332 Fiesta® platter is finished in a bright Lemongrass color, which can brighten any restaurant’s color scheme. The depth and length of the platter make it functional for many different foodservice settings, including buffets and table-service eateries. The Homer Laughlin 457332 platter is microwave, oven, and dishwasher safe.